In the past few months, I have been getting more and more questions from exporting companies who are worried about the effects of Brexit on their businesses. There are a number of areas that cause concern but two in particular are common for the companies I have been talking to. Firstly, Sterling has weakened significantly since the Brexit vote. That will either make Irish exports more expensive for UK customers or else will reduce the profit margin on the transactions for the Irish seller. Secondly, the introduction of customs controls could cause delays at the points of entry into the UK resulting in delays in receiving payment or in deterioration in quality of perishable products. 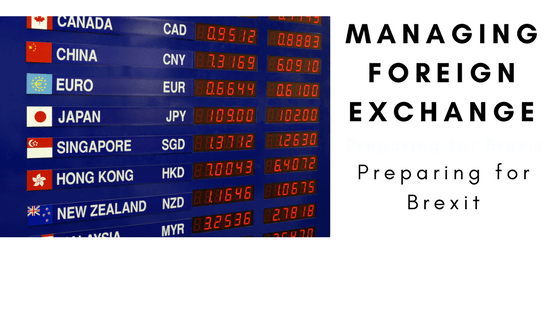 In this article, I am going to talk about the issue of managing foreign exchange. Back in my early years in employment, I worked for a large multi-national computer manufacturer and for a number of years I managed the treasury section which dealt with large foreign exchange transactions. My employer provided me with one weeks intensive training to become expert in that area. So I have some experience in that area. It’s a little bit different for Irish SMEs, than for multinationals, in that their transactions are smaller and the don’t have the specialist skills or often the time to devote to what could be a very significant element of the business. You might say that Sterling was never part of the Euro Zone so what’s different now. However, it is anticipated that there will be greater volatility in exchange rates in the future with Sterling expected to weaken and a weak sterling causes problems for Irish exporters. However, there are a number of simple things that can be done. There are a few key phrases that you need to understand. As a business you will be entering into transactions in foreign currency. The Euro value of those transactions can vary betForween the time you entered into the transaction and the time you pay or get paid from the transaction. Transaction risk relates to those possible exchange rate movements between contracting and completion. For example, let’s say that you agree to sell goods for Stg 50K when sterling is 1.125 =so at that point the sterling is worth € 56.250. However, the sterling-euro rate is moving so if it takes 2 months to receive payment that sterling could have a different euro value. For example, last August 50K of sterling was worth €54K while on 24 Jan it was worth 57.4K. That’s a swing of €3.4K and, depending on the size or profitability of your business, similar movements could have a big impact on your P&L. If you have assets or liabilities denominated in foreign currency then you have a translation risk. These assets could be physical assets or investments. The liabilities can be loans. Translation risk arises as the value of these assets or liabilities in euro can vary with the exchange rate from one date to another. The risk is that whenever you convert them back to Euro the Euro value could be significantly different to when you acquired the asset or liability. In my experience, translation risks are not significant for most SMEs. At its simplest, hedging is taking action, usually by entering into financial contracts, to protect your business against currency movements and to protect the underlying profit margins of your business. The first thing you need to do is to decide on what level of risk you are willing to carry. To do that you will need to have a good understanding of your business. How much foreign currency are you receiving in any period and how much will you be paying out? How much foreign currency will you be holding at any point in time? You need to understand the effect on your business that currency movements can have. You should try to quantify how much your profit would change for each 1% in currency movement. This is not an exact science. You may not be able to make exact predictions for your sales but you should use your experience to make informed estimates. You will not have full control over payment cycles but you will have a history to give you guidance. Once you have an understanding of your business, you will be able to say how much foreign currency you are comfortable holding knowing that its value can move. Typically, I get clients to prepare schedules of receipts and payments for each currency. The time horizon for these depends on your ability to forecast with reasonable accuracy. Anything greater than the amount of exposure you are comfortable with should be hedged. If you have both receipts and payments in a foreign currency then they will cancel out to a degree and that netting provides you with a natural hedge. A natural hedge is the reduction in risk that comes from the business’ normal way of working. If we go back to the forecast of foreign currency receipts and payments mentioned above, you should net off the receipts against the payments leaving you with a net foreign currency exposure. That is the amount that you have to manage. The natural hedging looks after the offsetting receipts and payments. Where you are netting of foreign currency inflows and outflow, you should consider using holding accounts for each foreign currency. You will deal with the surplus/deficit using the other tools that you have. If you have sales in Sterling, then you can create natural hedges by sourcing some of your expenses in Sterling. Another action you could take to create a natural hedge would be to invoice in Euros. This will eliminate the foreign exchange risk but create a different risk in that you have pushed the Foreign Exchange risk over onto your customer who could either push back on price or move to other suppliers who are happy to take the foreign exchange risk. Even if your supplier is Irish, if they have costs are in Sterling it may suit them to invoice you in Sterling so that they can create their own natural hedge. A useful tip for when you are calculating your exposures is to run a number of calculations of the euro value of the foreign currency using different exchange rates so that you better understand the impact of the exchange rates. Spot rate is the rate for immediate settlement of a foreign exchange conversion. It is based on the supply and demand for the currencies at the time of the quote. As a result, spot rates change frequently and sometimes dramatically. If I receive 10k sterling today and I ask my bank to convert it today, the rate they will give me is the spot rate. When you are dealing in spot rates, you have no certainty. The rate you get will be the rate offered by the market when you are dealing. You have no protection over your business margins. If the rate happens to be favourable, you gain. If the rate happens to be unfavourable, you lose. Additionally, you have no commitments. You have not entered a contract, in advance of the deal, to buy/sell foreign currency so you will not incur penalties if something happens and you cannot make the deal. For example, the customer may be late in paying you or you find that you can use your foreign currency for some other purpose, say buying an asset or materials. If you are comfortable with the risks and you have appropriate cash flow, it may be better to opt for spot rates and to be able to pick and choose when your convert your foreign currency. A forward contract is an agreement to exchange currencies for a fixed exchange rate on a fixed date or sometimes within a fixed date range. The rate used is called the forward rate. Traders calculate the Forward rates by taking the current or spot rate and adjusting for the difference in the interest rates between the two currencies. If I know that I will receive Stg 100K in 3 months’ time. I can go to an FX trader and agree a forward rate. In three month’s time, I will pay over the Stg 100k and receive an agreed amount of euros. The way the forward rate is calculated it to treat the transaction as if I borrow Stg 100K now and repay it in three months when I receive my customer payments. When I repay it I will be repaying the Stg 100K borrowed plus interest over the three months. The Stg 100K I borrow now is assumed to be converted to Euros and put on deposit for three months. Then in three months’ time, I will have the initial euro deposit plus three months of deposit interest. The forward rate is calculated by taking the Sterling repayment in three months and dividing it by the euro deposit value in three months. Effectively, this calculation is taking today’s rate and adjusting for the difference on interest rates between the currencies. The forward rate is not a prediction of what the exchange rate will be in three months. Forward contracts provide certainty about the rate that you will receive and effectively firm up your profit margin. You will not be able to benefit if the rate moves more favourably than the forward contract. It’s a contract so you are obliged to honour it. If you cancel it, you will pay a penalty which will equal the cost to the trader of having to make other arrangements. An FX option is like an insurance policy. With an FX Option, you buy the right, without any obligation, to exchange a currency at an agreed future date at an agreed rate. You pay a premium for the FX option. You do not have to exercise the option – there is no obligation to do so. Therefore, if the exchange rate is unfavourable on the future date, you can ignore the option but if the exchange rate is favourable you can choose to exercise the option. The FX Option costs a premium. You should factor that into the exchange rate to understand what percentage of your euros will go to pay the premium. However, while fx options can be expensive they do provide certainty. Now, having read down this far, you understand the risks. You have learned how to quantify them by preparing the foreign currency projections for receipts and payments. And you understand hedging and the basic tools for hedging. Lets now look at what should be in a Foreign Exchange Management Policy. The first step in managing currency risk is to understand and quantify the actual and potential exposures that your business has. This involves reviewing both your costs (both raw materials and overheads) and your revenues and preparing a schedule to establish your net exposure for each currency that you trade in. As a business you should agree and document your attitude to risk. This means that you and your fellow directors, if any, should decide how much foreign exchange exposure you are willing to tolerate. You may say that I can hold up to Stg 100K and bear the risk of that moving . Or it could be Stg 500K or Stg M or any other sterling amount. Alternatively, you could say, my profit margins are so tight, that I cannot take any risk. Whatever, the circumstances, you decide how much or how little risk you can take. Make a decision on that and review it regularly – quarterly or annually. You need to decide who will do what and when. Who will decide on the attitude to risk level? Who will prepare the foreign exchange projections ie quantify the foreign exchange exposures? Who will make the decisions on what hedging to do, if any? Who will execute the agreed hedging decisions? Document and approve those decisions and make sure they are communicated to the relevant personnel. Depending on the size of the organisation, you may want to get board approval for the Policy. If its an owner manager business, then this step is usually unnecessary. Once you have decided on the policy, put it into effect but always keep it under review. Both external and internal circumstances can change. Your profitability can improve or deteriorate, changing your appetite for risk. You could win other business in local currency reducing the significance of your foreign currency business. Competitors could enter the market forcing you to take more risks. No matter what you do to minimise the risk, the currency could still move in such a way that you would have been better if you hadn’t done anything. For example, if I decide to eliminate risk by entering into a forward contract to sell Stg 100K at 1.13. I am happy if the exchange rate when the contract matures is higher than 1.13. But if it is lower I lose. So you have to understand the effect on your business of the various movement possibilities and accept that by eliminating a possible downside you are also eliminating a possible upside. It really all about protecting the business. understand your business and how its affected by FX movements. Follow through by implementing the policy as your carry out your business. This is a quick overview of foreign exchange for SMEs. If you have any questions feel free to contact me by email. If you are unsure how to prepare projections for your business, you may find my article on How to Prepare Financial Projections useful. What KPIs should I use? What is a VIES Return?